I wanted to know one thing: what is your favorite Gospel? And why? Leonardo. Good Leonardo. The Gospel is full of beautiful, beautiful steps. But you asked me what is the favorite. I will answer as long as you return home, search the passage in the Gospel and read it. Promise? A passage that I really like is that of the Gospel of Matthew, when Jesus meets that businessman, that traitor of the country that was called Matthew. He was right at the city gate, attached to the money, and he charged the taxes to tourists. Have you paid taxes to enter here? No! But we see that there is no Matthew here, thank God! They do not charge you entry. Is fine. And that man was a traitor to the country because he paid taxes and gave it to the army that occupied Palestine at that time - it was the Roman army -; he gave it to the Romans. And this is a bad shame, is not it? What an ugly thing! A person attached to money is a bad person! But this more, because he had forgotten his belonging to his country; he sold his country every time he charged everyone. And Jesus passes - these people were despised by everyone - Jesus passes by, looks at him and says: "Get up, come". And this man could not believe it. A despised man, traitor, sinner ... And that man got up and followed Jesus. And why do I like it? - the second question - because we see the strength that Jesus has to change a heart. This was the worst, yet Jesus managed to change it. Perhaps you will know people who say: "Ah, I will never be good, because I have so many things behind me, I will never be able to change ...". And Jesus is able to change the worst and make him an evangelist, an apostle and a saint. This is why I like this passage of the Gospel so much, because we see the power of Jesus to change our hearts, to make them good. Do not forget the promise: what was the promise? But not all whole! Read that passage. You look for it. Matteo's name was Matteo, but his name was Levi at that time. Levi, Matteo. Look for it, read it at home and say: "Look at this, look at this ...". It's nice. Thanks Leonardo, thank you! Hi Pope Francis! When we receive baptism, we become children of God and people who are not baptized are not God's children? Stay there. What's your name? Carlotta. Tell me Carlotta, giving back to you: what do you think? Are people who are not baptized, daughter of God or not a daughter of God? What does your heart tell you? Yes. Here, now explain. He responded well, he has a Christian flair, this! We are all children of God. Everyone, everyone. Even the unbaptized? Yes. Even those who believe in other religions, far away, who have idols? Yes, they are children of God. Are the mafia too God's children? ... You are not sure ... Yes, even the mafiosi are children of God. They prefer to behave like children of the devil, but they are children of God. All, all are children of God, everyone. But what is the difference? God created everyone, loved everyone and put conscience in the heart to recognize good and distinguish it from evil. All men have this. They know, they perceive what is good and what is healthy; even people who do not know Jesus, who do not know Christianity, all have this in the soul, because this has sown God. But when you were baptized, in that conscience the Holy Spirit entered and strengthened your belonging to God and in that sense you have become more daughter of God, because you are daughter of God like everyone, but also with the power of the Holy Spirit that has entered inside. Did you understand, Carlotta? I ask - everyone answers -: all men are children of God? Pope Francis:Good people, are daughters of God? Pope Francis:Bad people, are daughters of God? Yes. Do people who do not know Jesus and have other distant religions, have idols, are daughters of God? The mafia, are they children of God? And we must pray for them to come back and truly recognize God! No one answers now, but responds to the heart: who of you prays for the mafia, why do they convert? Everyone answers in his heart. Then, when we are baptized, who enters our heart? ... Stronger! Good boy! You're good! What's your name? I would like you to say it like me. He says: "Do not grieve the Holy Spirit within you". Why do you say that phrase? Because a Christian, a baptized person who behaves badly, saddens the Holy Spirit who is in us. The phrase is this: "Do not grieve the Holy Spirit within you". "Do not grieve the Holy Spirit within you". We say it? 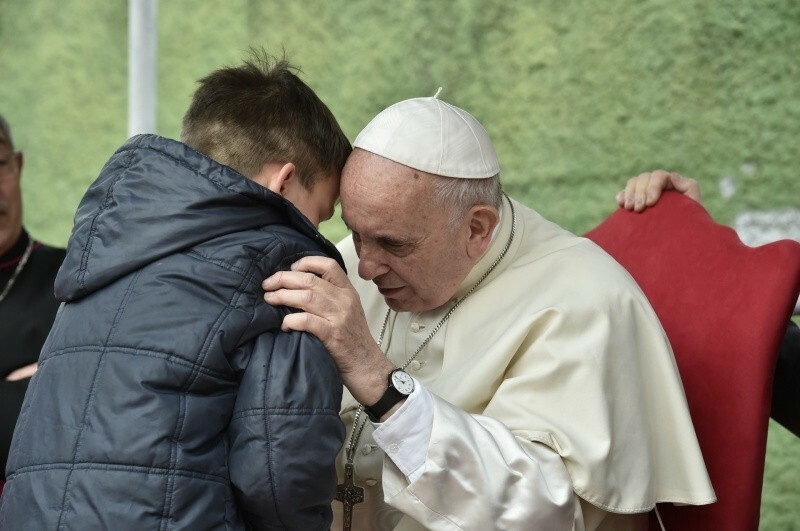 Pope Francis with the children: Do not sadden the Holy Spirit within you. Pope Francis: Another time! Pope Francis with the children: Do not sadden the Holy Spirit within you. Pope Francis: And we, children of God, that through Baptism we have the Holy Spirit inside, when we behave badly, when we sin, we grieve the Holy Spirit who is in us. Thanks Carlotta! III. Edoardo: Dear Pope Francis, how did you feel when they elected you Pope? Pope Francis: What's your name? Pope Francis: Edoardo, good. I only heard that God wanted that, I got up and went ahead. I have not heard anything spectacular, but perhaps, this answer seems a little boring, but I have not felt fear, I have not felt a special joy. I heard that the Lord wanted that, and move on, Edoardo. The Lord often calls. I greeted one of you who is in vocational search because he feels that the Lord tells him something inside. But when the Lord calls and tells you: "Now you go that way", it gives you peace. This is what one feels when there is a true call of the Lord: peace. I felt peace. Thanks, Edoardo. Pope Francis: God abandons his children? Pope Francis: God abandons his children when they are good? Pope Francis: Here, Emanuele, this is the answer. God surely was proud of your father, because it is easier to be a believer, to baptize children, to baptize them as unbelievers. Surely this God loved it so much. Talk to your dad, pray your dad. Thanks Emanuele for your courage. We talked about dad and our dad is God. We all pray to our father, God. "Our Father ...". And now I will give you the blessing. Each of you think of those people he loves, those people he cares about, those people who love him, and even those we do not love or who are a bit 'enemies. We also pray for them, because the Lord also blesses them. May he bless us all and enlighten the heart.